As reported in Peter Timmins' Open and Shut blog this morning, the Attorney-General, Mark Dreyfus, has announced that Australia will be joining the Open Government Partnership (OGP) - the leading global organisation for states working towards more open government. Australia is the 59th country to join the OGP, following Ireland (who sent a letter of intent last week) and excluding Russia, who has just withdrawn their application. It makes us the fifth country in the Asia-Pacific region, behind South Korea, the Phillipines, Indonesia and Mongolia. This is a timely (if not overdue) commitment by Australia, particularly considering how well-developed our government transparency regime is already. 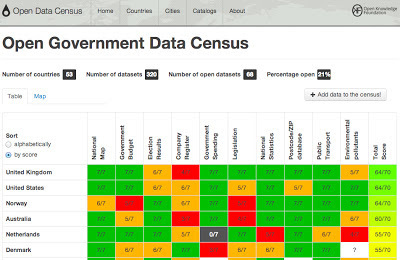 We're ranked 4th in the country list of the Open Knowledge Foundation's Open Data Census (see below). Now the questions we'll see answered to over the next few years are: how will OGP membership influence the level of attention and mandate for open government in Australia; how will it affect how Australian Government agencies operate, and; will New Zealand follow suit? 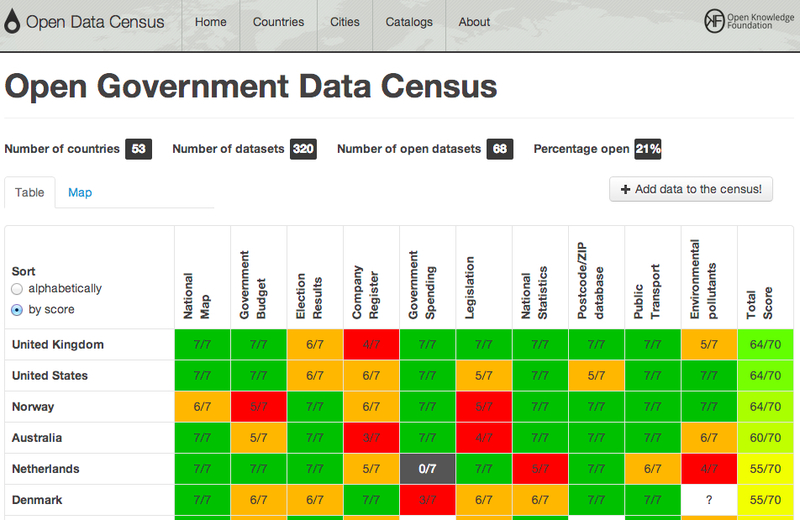 Great concept, shame about the data quality. I do lots of work with legislation and the UK's perfect score is farcical considering that only about 1/2 of all legislation amended since 2002 and the rest is bedevilled by broken links. Apologies for the missing words: only about 1/2 of all legislation amended since 2002 is available in its amended form. This makes it hard to make sense of the law (just as the missing words in the previous comment make it hard to follow).